from: Suite 101: Ancient Roman Desserts – What Did They Eat? Ancient Rome had neither refined sugar nor butter, two ingredients perhaps most closely associated with dessert foods today. This does not mean that the ancient Roman kitchen was without dessert foods, or that desserts were in any way limited. The Roman imagination supplied great variety. The sources for Roman dishes range from pure cookbooks such as Apicius, a Latin collection of recipes from the 4th or 5th century CE, to the Deipnosophistae of Athenaeus, a Greek dialogue from the 3rd century CE that just so happens to take place at a banquet and occasionally touches upon food and drink. Even today in many Italian restaurants the principal dessert is the fruit platter. Served with honeyed wine, nuts and fruits, both fresh and dried, offer a light sweetness following a heavy meal. It was a versatile dish. In the earliest times, sources recount, apples were a principal dessert fruit, but the upper classes of the later empire had great choice among exotic imported and out of season fruits. Martial, for example, reportedly once served pears imported from Syria with his more locally sourced roasted chestnuts from Naples. Very sweet fruit was always favoured, such as figs, grapes, plums or dates. The truly rich and extravagant might garnish the fruit elegantly or serve it dipped in gold. The Romans also had various candies made from dried fruit. Much as fig cakes and apricot leather is made in the eastern Mediterranean today by puréeing or beating the fruit and allowing it to dry into a flat sheet, so the eastern Romans made dessert candies. Even millennia before the invention of the freezer, the upper crust of Roman society had frozen desserts. A forerunner of ice cream, sorbet and slush drink is mentioned at the court of that extravagant emperor Nero. His chefs had ice and snow brought in from the mountains and flavoured it with citrus, fruit and berries. 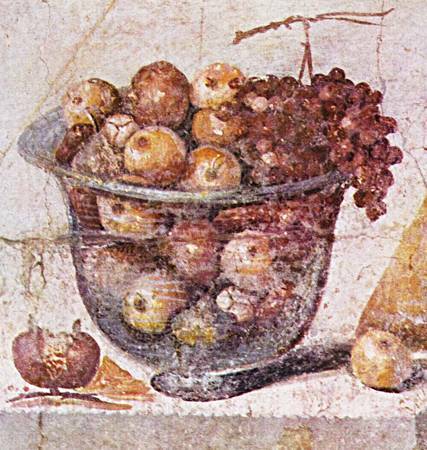 Though not nearly as popular as the fruit dishes, the ancient Roman kitchen also included a number of soufflés and puddings. One such is known as savillum, occasionally likened to cheesecake. For this dish, cheese was combined with flour, honey and egg into a batter that then baked until it had risen like a soufflé. When set, the savillum was brushed with honey, topped with poppy seeds and served on a plate and eaten with a spoon. Roman pastries, cakes and biscuits have much in common with both western and eastern modern pastry traditions. The pastry chefs of the Roman empire created extravagant Danish pastries, called spira, as well as simple sponge cakes, called enkythoi. Baklava and doughnuts, too, had Roman forerunners.